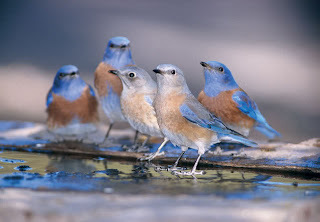 Animal Wildlife | Bluebird Blog | The bluebirds are a group of medium size birds, mostly insectivorous or omnivorous birds in the genus Sialia of the thrush family(Turdidae). Bluebird birds are one of the few thrush genera in the Americas. 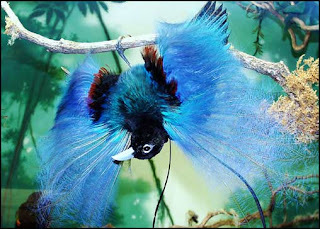 Bluebird color consists of blue, or blue and red plumage. 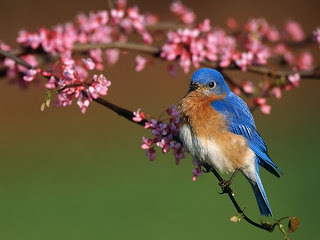 Female birds are less brightly colored than males,although color patterns are similar and there is no noticeable difference in size between sexes..
Bluebirds are territorial,prefer open grassland with scattered trees and are cavity nesters(similar to many species of woodpecker).Bluebirds can typically produce between 2 and 4 broods during the spring and summer(March through August in the Northeastern United States).Males identify potential nest sites and try to attract prospective female mates to those nesting sites with special behaviors that include singing and flapping wings,and then placing some material in a nesting box or cavity.If the female accepts the male and the nesting site,she alone builds the nest and incubates the eggs. Predators of baby bluebirds in the nests can include snakes, cats and raccoons. 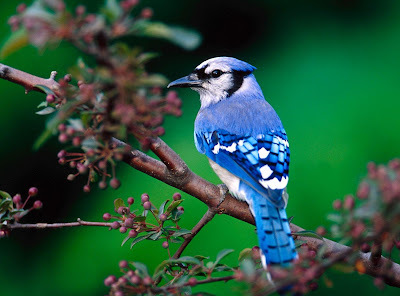 Non native and native bird species competing with bluebird birds for nesting locations include the Common Starling,American Crow,and House Sparrow,which take over the nesting sites of bluebirds,killing young and smashing eggs and probably killing adult bluebirds. 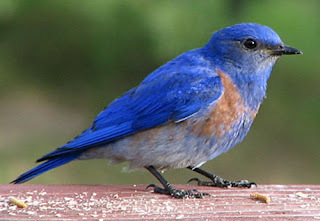 Bluebirds are attracted to platform bird feeders,filled with grubs of the darkling beetle,sold by many online bird product wholesalers as mealworms.Bluebird birds will also eat raisins soaked in water. In addition, bluebirds in winter use backyard heated birdbaths. 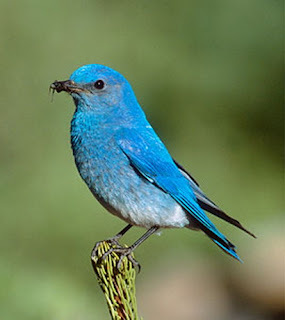 By the1970s, bluebird bird numbers had declined by estimates ranging to70 % due to unsuccessful competition with house sparrows and starlings,both introduced species,for nesting cavities,coupled with a decline in habitat.However,in late2005 Cornell University\\\'s Laboratory of Ornithology reported bluebird sightings across the southernU.S.as part of its yearlyBackyard Bird Count,a strong indication of the bluebird\\\'s return to the region.This upsurge can largely be attributed to a movement of volunteers establishing and maintaining bluebird bird trails. 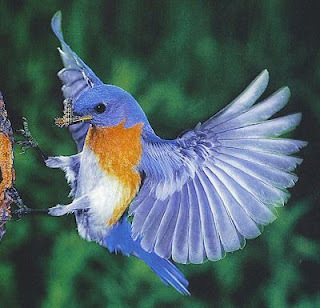 Of all the birds a gardener could choose to attract,the bluebird bird is the quintessential helpful garden bird.Gardeners go to extreme lengths to attract and keep them in the garden for their beneficial properties.Bluebirds are voracious insect consumers,quickly ridding a garden of insect pests. 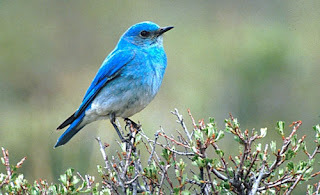 1 Response to "Bluebird Bird - Facts About Bluebirds and Their Pictures"
Awesome photos of Bluebird really nice..